For this review, I want to do things a little differently. 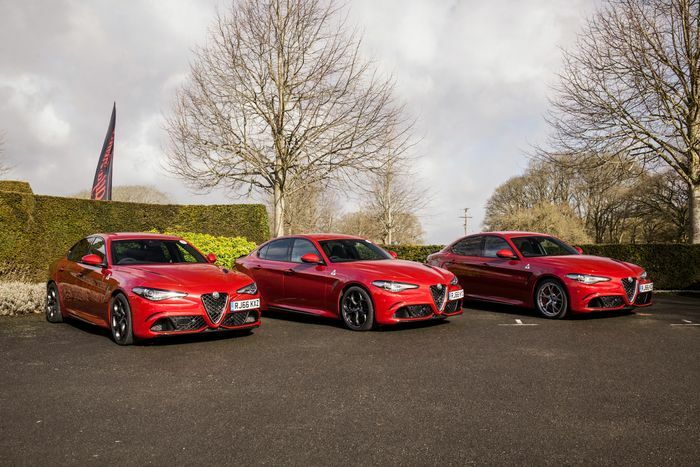 You see, the problem is quite a lot of gushing is about to happen, as I’ve finally had a proper, long drive in an Alfa Romeo Giulia Quadrifoglio at the car’s UK launch, confirming what I’ve been hoping: it’s bloody mega. So to offset the outpouring of praise, I’m going to go through everything that’s not so great about the hottest Giulia. And there’s quite a bit to get through. First of all, it’s really quite cramped inside. 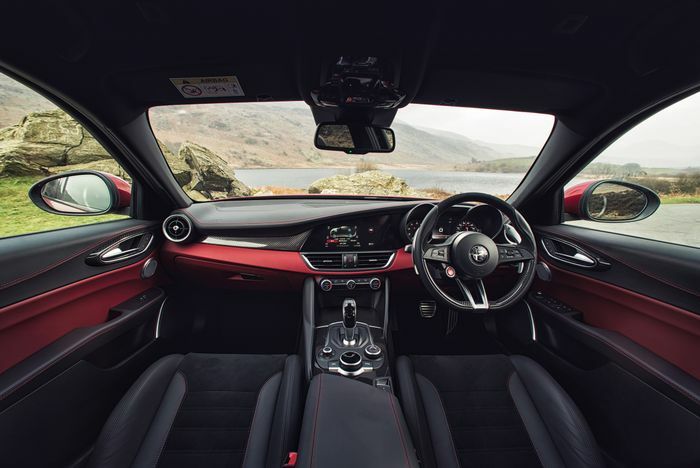 The Giulia’s cosy interior reminds me of the equally compact Jaguar XE. And while the overall cabin design is jolly nice, there are numerous cheap-feeling buttons and rotary dials, which look out of place in a car that’s supposed to be taking on the likes of BMW and Audi. Also in the cabin you’ll find a less-than-brilliant infotainment system, and moving to the outside, I don’t know if I’m 100 per cent sold on the looks. From the rear it looks fabulous, but in person the nose looks decidedly slab-fronted. I actually think the BMW M3 is a much better-looking, cohesive design. Aren’t Alfas meant to be prettier than everything else out there? The shut lines aren’t exactly going to give the German big three any sleepless nights, either. Finally, I’m going to have to take umbrage with the brakes, because although they’re mightily strong, the pedal itself is fly-by-wire with no physical connection. It never feels natural - it’s overly firm and quite hard to modulate when coming to a stop, though I suspect you’d get used to it in time. So, that’s the bad stuff out the way. Where was I? Ah, yes: the Quadrifoglio is an utterly stonking, thoroughly wondrous chunk of car. And to explain why, I’m going to start with the engine. The official company line is that the Quadrifoglio’s 503bhp, 2.9-litre, twin-turbo V6 is ‘inspired by Ferrari’, but when you bear in mind it has the same bore and stroke as the 3.9-litre, 90-degree V8 in the California T, we - and most of the motoring world - suspect it goes a little further than that. This is - for all intents and purposes - a Ferrari-engined saloon car. And it’s quite an engine. It doesn’t belt out quite as spectacular a noise as the old N/A ‘Busso’ Alfa V6s, but it makes a damn good din. 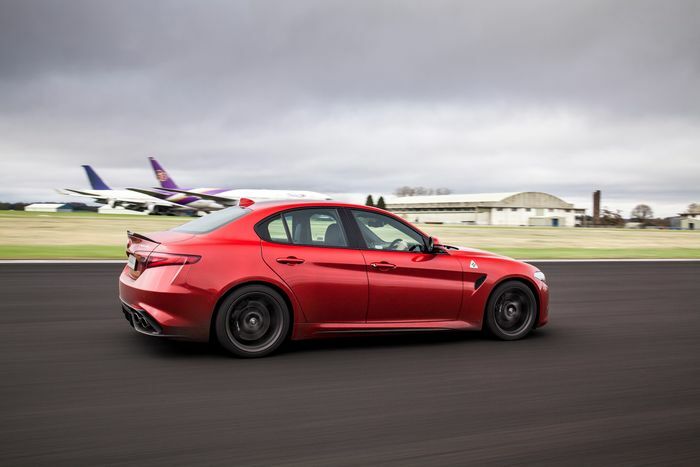 The throaty, angry melody that exits the Quadrifoglio’s quad tailpipes puts the frankly weird-sounding M3 to shame, and I prefer it even to the V8 Mercedes-AMG C63, which seems to sound worse the more you rev it. It’s a strong, responsive engine, and one that feels excitable right up until the moment you smash into the 6500rpm redline. You feel like an extra 500rpm wouldn’t go amiss, but you don’t have long to dwell on that, with the eight-speed ZF automatic transmission quickly banging home another gear with surprising aggression. I’ve lost count of the amount of cars I’ve driven with the ZF ‘box, but it’s never felt anything like it does in the Alfa. It’s the same fast and efficient ZF we know and love, but a little more pissed off than usual. Whatever Alfa did to the software has worked wonders, while the big, column-mounted (rather than wheel-mounted) shifters make you feel as though you’re in an exotic supercar. In a way, you sort of are. You can consider that a big tick in the straight-line performance box, but, thank god, this is an Alfa Romeo that’s also properly sorted in the handling department. 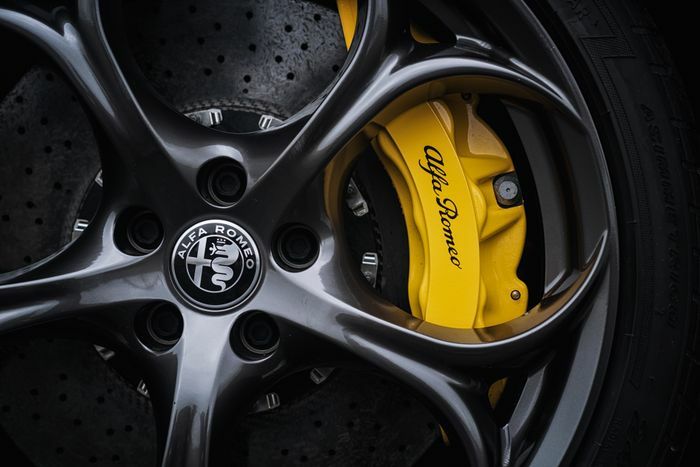 No longer burdened with borrowed front-wheel drive platforms, the Giulia has an all-new rear-wheel drive platform called ‘Giorgio’, created by a bunch of clever people pinched from Ferrari (the same people who ‘didn’t’ create a V6 from the California T’s V8), including Phillipe Krief, the chap responsible for the 458; someone who knows his onions when it comes to how a car handles. 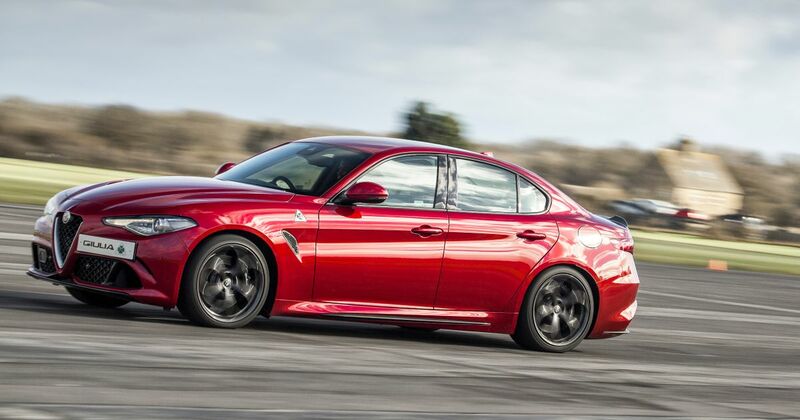 This further ‘Ferrari influence’ is very much apparent in the way the Quadrifoglio drives. It’s tight, agile and responsive. While the steering lacks in the feedback department (which is pretty standard these days), it’s ruthlessly, almost unnervingly quick, and the chassis begs to be chucked around. Exactly what it’s like to drive depends greatly on where the ‘DNA’ switch is set. A stands for ‘Advanced efficiency’, which sees one bank of the V6 shut down to save fuel and contribute to an official economy figure of 33.2mpg. N is for ‘Normal’, and D stands for ‘Dynamic’. Oh, and there’s also Race which switches off all electronic interference, bar the ABS. Each has an effect on throttle response, steering, gearbox anger and suspension. Dynamic is where you’ll want it during most fast road driving sessions, although the ride is almost punishingly hard on some UK roads - fortunately there is an option to leave it in Dynamic while softening the adaptive dampers. 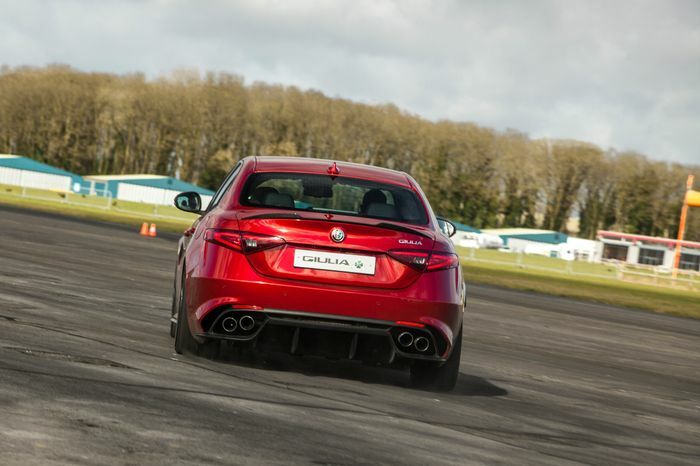 There’s a beautiful balance to the thing, and when deliberately pushing past the limits on a small handling course at Kemble Airfield as part of the launch, the Giulia showed itself to be superbly controllable as the torque-vectoring rear end is made to step out. 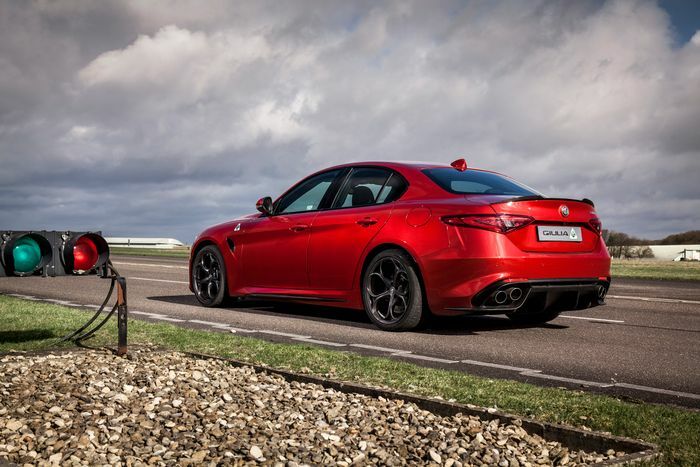 Even for an imbecile like me, it’s an approachable thing, as I found late last year when having a Quadrifoglio-flavoured taster at a soaking wet Silverstone. It’s more exciting than a Mercedes-AMG C63, more manageable and predictable than a BMW M3, and immeasurably cooler than both. I’ve said before that I consider the aforementioned Merc to be the king of the super saloon world, but now? If I happened to have a spare £60,000 floating around (I don’t, sadly), I couldn’t imagine spending it on anything other than this glorious return to form from Alfa Romeo.